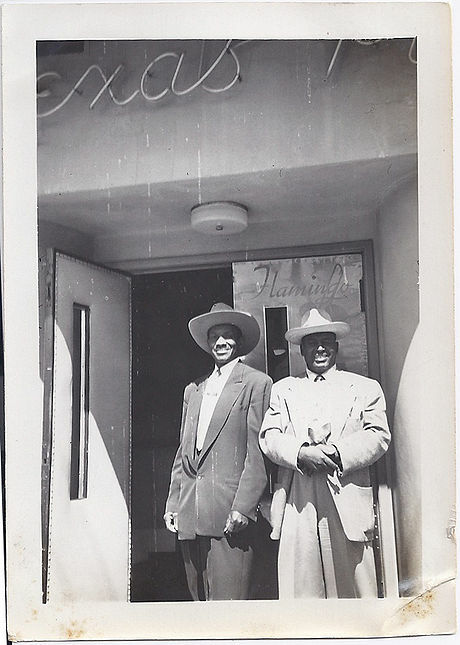 Wesley F. Johnson, Sr. in the early 1950s, at his former nightclub, the Texas Playhouse, also known as Club Flamingo. It was on Fillmore between Sutter and Bush Streets. At the front door of the Texas Playhouse/Club Flamingo. 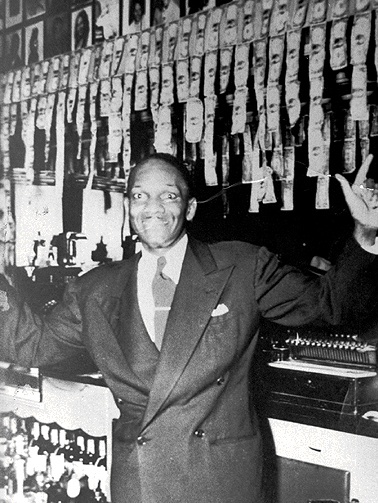 Bassist Vernon Alley, a San Francisco native, describes, from his black perspective "the time in San Francisco when black bands couldn't play east of Van Ness Avenue, and that's true. I was a part of it. I was one of the guys who helped bring it down. Saunders King had a little group and we played down at Sutter and Powell at a place called the South Seas. There were [other] musicians' unions and the other [white] musicians' union used to fight having us play downtown. Unless it was a place like Zanzibar, Plantation, an African name, the Cotton Club or something like that." Many a black musician struggled to make a living by playing behind curtains for tourists at strip joints, out of sight so the audience could concentrate on the strippers. It was demeaning work, but it was steady. The situation at Jimbo's Bop City was different from the rest of America. Former Bop City patron and long-time supporter of integration Patricia Nacey explains, "What was exciting about Jimbo's was it didn't matter. Your race or your color or your gender, even. If you wanted to go out and listen to music that's where you could go."